Seems like the blink of an eye and we said the same thing same time last year! Time sure seems to go faster and faster the older I get. 2014 has been a great year here at the Stroud household. Many thanks to those of you who take classes, who read the blog, and who are patient at what must seem like interminable gaps between posts. It's not that I'm not thinking of you--I just need a few more hours in every day to get it all done. Hope springs eternal for 2015! If you have plans for tonight, remember the designated driver, and for those of you in the "snowy" states, be safe on the roads. 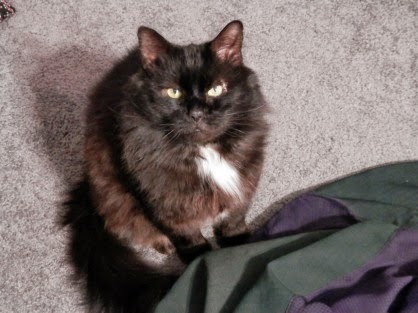 From Dickens and me, have a safe and happy New Year's Eve. Whether you have snow, rain or sunshine, it's Christmas! Enjoy this special time with family and friends. It's not the gifts that are important; it's the love that surrounds us. in the sewing room with care. 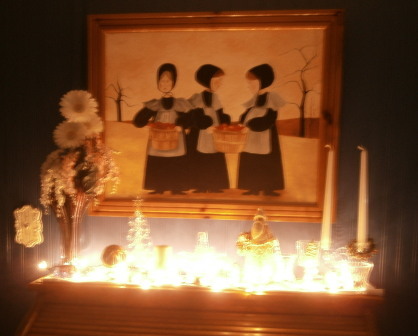 Mitten Girl gave me this panel several years ago, and this year I emptied the design wall in my sewing room and hung it there. 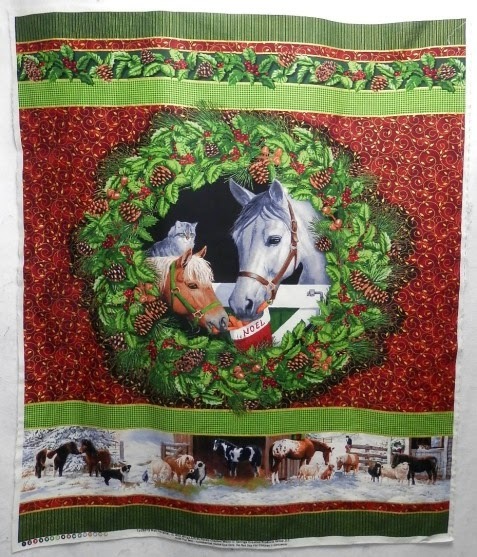 Yes, it's still just the panel--mainly because I can't bear to quilt over the horses' faces. I just love it. P.S. Thanks again, Mitten Girl! We've all asked the questions--what iron are you using? Do you like it? Does it leak? Does it have enough steam? 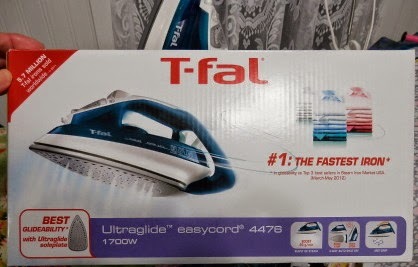 I think an iron is as personal a choice as a handbag. 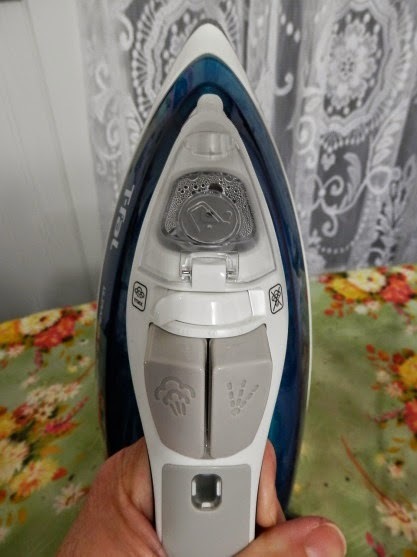 I have an older Rowenta (think double-digit years old) that still works but doesn't steam quite as well as when it was new, and near the iron end of the cord it is getting a little warm. I have tried other irons and have had marginal luck at best. I knew I had a lot of pressing to do over the next few weeks, so I meandered down the ironing aisle of a local box store. I am not a big fan of auto-off, but that seems to be the way of irons at the moment. Eight minutes until it goes off in the upright position. Not a lot of time--but when the iron is tipped to reactivate it, it does not take long to reheat. The cord moves up and down within the stand (which is triangular and very sturdy), so that the cord does not bunch up the fabric you just ironed. Water reservoir is easy to fill. LOTS of steam and the iron glides smoothly. There is one model that is 1750 watts of power, but the color was a dark gray and, with everything outside seemingly so gray, I wanted something brighter. I like the color of this model (not that color has to be your determining factor). But it was an extra $10 for only 50 watts more. In my mind, late at night, brighter won over more power (and you know that is seldom the case in my world of More Power Always!). You can see the triangular base here. Lightweight iron overall. But still gets the job done. The control panel--steam/no steam lever, burst of steam, spray, filling station. The only thing I am still getting used to is the spray. It seems to spray out well away from the iron--like across the width of the ironing board. But I also have a spray bottle of water close at hand. A minor inconvenience at best. And it's probably the crazy person operating it. And at about $35 I can get used to it. 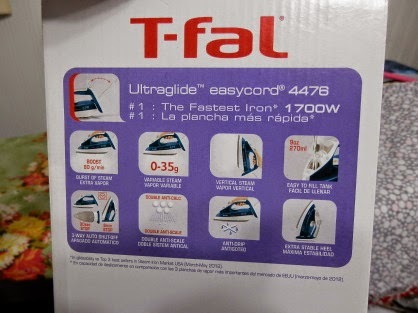 So now you have my opinion on this iron. No official testing, just real life use. I do not get endorsement fees or free products to try. 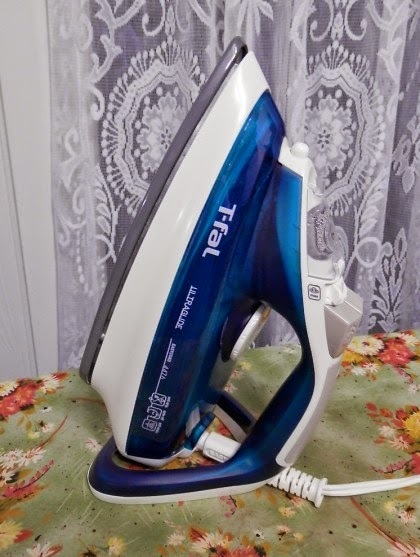 Please feel free to leave comments about what irons you like and why. Happy Hanukkah to those celebrating that tradition. P.S. I am listening to W is for Wasted by Sue Grafton. Well, it snowed and it snowed and it snowed. Not as bad as what Buffalo got earlier, but enough for us to be snowed in. I am a firm believer that you never do snow removal while it is still snowing. So on Thursday, when it looked like we might be done, I trudged to the Casket Company Brewery shed and found that my snow blower didn't start. (My electric starter went last year, so it is manual crank only now.) I cranked and I cranked and...nothing. So I closed the shed, shoveled the porches and figured there's always tomorrow. With the snow being above my knee-high boots all the way to the road, and heavy, I decided I needed a better plan of action. So a few phone calls later I found someone who would come and plow for me! He came a bit later and did an excellent job of moving the snow around. (Even with four wheel drive I couldn't have made it out the end of the drive before.) Then the adventure! My mom also needed her drive done. Because our drives are long and curvy, it helps to have someone along who is familiar with them. So I rode with the driver and his very friendly dog up the road and got a first-hand look at plowing from inside the cab! It was a hoot! Let me tell you, David can put that plow down on a dime! We were done in no time and it was a lot of fun. No, it wasn't on my bucket list, but it pays to say yes when adventure beckons! To complete the outdoor experience, I went back up to my mom's and did the snowblowing and shoveling of paths. That snow blower did start, but there was no way I could have done the drive with it. The snow was so heavy, packed down, and dense that I had to walk in front of the snow blower to break up the snow, then go behind the snow blower and try to keep it moving. I guess that counts as the second adventure, as I had never used that snow blower before and it looked like a cockpit to run the controls! So there you have it--hey, wake up--it wasn't that boring a story, was it? P.S. I am listening to W is for Wasted by Sue Grafton and I just finished Private Down Under by James Patterson. P.P.S. Lest you think I get in trucks with strangers, breathe a sigh of relief. David is the grandson of people I have known my entire life. I may be weird but I'm not that crazy.